Open Dental is our top choice for dental practices looking for desktop-based practice management software, due to its affordable pricing and due to the flexibility that the system provides users. Flexible system integrates with most imaging and software systems. Provides users full access to their practice’s database, which enables users to create highly customizable queries and reports. Robust practice management system at a fraction of the cost, compared to its competition. Officially only compatible with Windows, but some users may be able to modify the application to work on Linux/Mac if needed. Database storage and encryption are your responsibility; Open Dental does not store and encrypt your data on their servers like cloud-based software solutions do. Remote access to your data takes a bit more configuration than web-based alternatives. 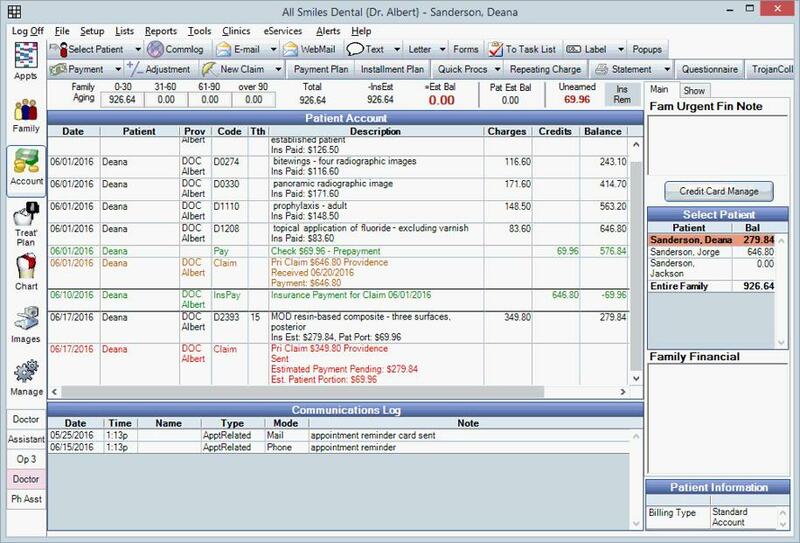 For roughly $100/month, Open Dental offers many of the time-saving and paperless features that users typically look for in dental practice management software: insurance claim validation, business-critical reports, powerful scheduling and charting capabilities, and much more. However, one feature that distinguishes Open Dental from other players in the industry is that it gives users full access to their practice's database, which enables users to create powerful custom reports and queries. Open Dental does minimal advertising, but has gained popularity throughout the dental community just from word of mouth. Is Open Dental the right software for you? Whereas many major dental software companies store your data within proprietary databases that make it difficult for you to retrieve after your contract ends, Open Dental ensures that you have complete control over your data at all times, by giving you access to the MySQL database used to store your data. This is particularly beneficial if you ever want to create highly customized reports or transfer data to another software provider. Although Open Dental gives you more control over your data, it also leaves you responsible for developing a data storage and backup strategy. Cloud-based software companies typically take care of storing and backing up your data on their remote servers, but with Open Dental, you will be responsible for encrypting, backing up, and managing data on your own servers. Open Dental is also not designed to work in a web browser, like many web-based software solutions. The company has stated that it may develop a web-based solution in the future, but there is currently no timeline for its release. While cloud-based competitors offer the convenience of automatic data backup and remote accessibility, Open Dental offers more features than its competitors, at a more affordable price. Though Open Dental can be hosted on the cloud, the software is designed to be server-based, and as a result, very few of its customers use the cloud to host it. Open Dental's monthly fee includes unlimited support and constant software updates, which is not the case with many other dental practice management software options. As an open source software company, Open Dental makes its profits off of support subscriptions, which means that it has more of an incentive to offer high-quality support and frequent software updates to ensure that the software keeps working smoothly and that high priority features are added. Open Dental is our top choice for locally hosted (non-cloud) dental practice management software, and is a favorite amongst the dental community. Free trial, including a free test conversion from your previous practice management software, so that you can try the software with your real data. If you decide to move forward, the price of full data conversions varies. Pay only for customer support -- it’s free to use the software without customer support after the 6 month contract. EHR features/reporting: $720/provider/year, if you sign up for a 12-month support contract. Open Dental was founded on the idea that users, not software companies, should have complete power over their data. It was developed in 2003 by Dr. Jordan Sparks, a dentist who was dissatisfied with the status quo of dental software. With a tech team of 12+ software engineers, the company has made a commitment toward delivering high quality software for dentists, and this is evident in its decision to make their software open source. Many software providers make it difficult to transition your practice to a new system down the line —- data must be extracted and converted, often with mixed results. Open Dental provides users with access to the database schema instead of hiding it behind closed doors, as is the case with many proprietary software companies. This means that in Open Dental, you can export whatever combination of data you need, instead of being limited to specific queries. The bottom line is that you can create very detailed custom reports that help you understand your business on every level. Before deciding to invest in Open Dental, you can download a trial version of the program and perform a test data conversion on your data, free of charge. Because you actually get to experiment with using the software with a sample of your actual data, you can determine if it’s the right software for you before deciding to purchase anything. Once you decide to convert, you can work with Open Dental’s support team on the full installation, which can be done remotely, and typically takes only about half an hour. Rather than charging for the software itself, Open Dental offers support subscriptions to its users. Subscribers gain access to frequent software updates, unlimited telephone support, and eService features, including ePrescriptions and online patient forms, patient communication solutions (email/text), and an online patient portal. Subscribers often take advantage of telephone support in order to quickly get answers to their questions. You can also reach out to support to request features to be added to the product, and Open Dental will then prioritize the features and add the most important requests in subsequent software releases. The software can integrate with other software programs that you use to run your practice, via "bridges". Each bridge enables you to link Open Dental to other software programs you may use to run your practice, including imaging software, marketing tools, and more. Because Open Dental bases its business on offering support and software updates to its subscribers, it has more of an incentive to respond to users' requests to develop new features and integrations. Other software companies often limit their integrations to whatever clearinghouses, credit card processors, and imaging software providers they've partnered with, which limits your options if you happen to use software that they do not support. You also have the option to develop your own custom bridge to any program that you currently use, such as Excel or Outlook. This is another benefit that stems from being open source: proprietary software companies typically don't enable users to develop and build their own extensions. In addition to allowing you to request and create custom integrations, Open Dental's core functionalities are highly customizable; each module is configured with settings that can be tailored to reflect the workflow that suits you best. If you’re looking to transition to a paperless practice, then Open Dental is the software for you. Below, we discuss the key features of Open Dental, and how they can benefit your practice. One of Open Dental's greatest strengths is its dedication to giving users options to customize and take control of their software. Although Open Dental already integrates with many of today's major imaging software companies, the company has stated that it will pursue all requests to develop bridges to any imaging software it does not already support. It's highly likely that your imaging program is already compatible with Open Dental, but if you find that your software isn't currently supported, you can request that they work on adding it into a future version of the software. Charting is one of the most compelling reasons for dentists to switch over to using dental practice management software. It's clear that Open Dental has dedicated a lot of thought into designing its Chart module. The 3D tooth chart includes many different notes sections, including a casual notes field (for information such as conversational points), medical urgent notes, medical history notes (medications, allergies, family history, etc.). You can also mark the patient as needing to be pre-medicated (which will activate a flag in the Appointments module). 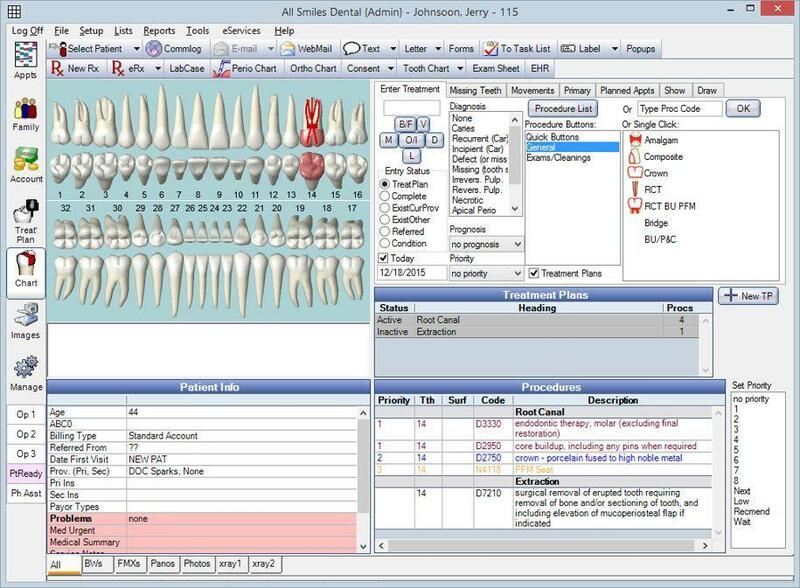 The Chart module includes support for four tooth numbering systems. You can customize its appearance as well as its functionality. For example, you can edit the color scheme and specify whether or not to always skip teeth that have been marked as "missing". The Chart module is designed with several time-saving features. You can create custom procedure buttons based on the procedures you most commonly use, and search-as-you-type functionality allows you to quickly select a search result when you type in procedure/ADA codes. The software is also designed with Quick Pace notes, which are personal shortcuts to frequently typed sentences. You can set up your own quick notes with abbreviations so that they can easily be accessed and inserted into your notes. Another time-saving feature is Auto Notes, which are essentially a fill-in-the-blank template. Auto Notes prompt you for responses to a series of predetermined questions that you can set up beforehand and use over and over again. After you have completed your notes, the software allows you to sign off on the note digitally, saving you the trouble of filing a paper version of the note. Consent forms can also be brought chairside to the patient and signed digitally in the office. Saving all of the treatment options as different plans comes in handy if you ever need to access them in the future. You can also print and email treatment plans directly from the software. Once the patient has approved a treatment plan, they can sign it digitally by using a stylus (Windows Tablet PC) or a Topaz signature pad. For more complex treatment plans that include many procedures, the Treatment Plan module allows you to prioritize planned work. To use this, you simply group procedures and mark them with the appropriate priority numbers to rank them in whatever order you like. If you find that you need to refer out a treatment, Open Dental also helps you execute and organize referrals. The software creates a custom referral slip from the treatment plan. This data can later be retrieved in a custom report that allows you to track referred treatments. Insurance claims and billing are handled within Open Dental's Account module. To create a claim, you can highlight the relevant procedures and choose to either send the claim immediately through an electronic claim, or as part of a batch at the end of the day. Open Dental automatically validates e-claims and alerts you to any missing information, and is integrated with many popular clearinghouses. You can see a list of known clearinghouses that Open Dental is integrated with here. Once the claim's status changes to "sent verified", it will be updated with the insurance's estimated contribution. If the patient still owes anything, you can record the payment details from a customizable list, and record a payment. The Account module shows you the patient's estimated balance, including the insurance provider’s estimated contribution. When you're done, you can print or email a walkout statement of that day's activity, or simply produce a receipt of that day's payment activity. The statement will also list the patient's next scheduled appointment (if applicable), which helps remind your patient of his/her next appointment. Open Dental's support subscription includes a patient portal, which gives your patients the option to fill out their forms prior to their appointment. If a patient has not already filled out their forms, they can do so using a kiosk in the office. The forms will automatically be added to the Open Dental system so you won't have to scan anything in or input data manually. Scheduling is a key component of running a successful dental practice. 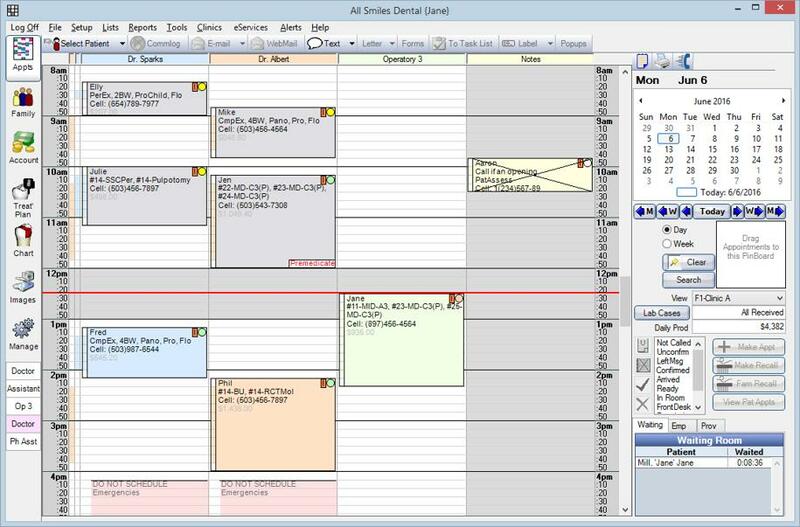 Open Dental offers many scheduling features to keep your practice organized and efficient. Recall List: All patients due for exam/cleaning but have not yet scheduled. Confirmation List: Every confirmed appointment on your calendar. This also works in conjunction with the text appointment confirmation feature if you're subscribed to that eService. Planned Tracker: A place to organize pre-planned appointments (work that has been treatment planned). It's important to reach out to these patients to ensure that your patients follow through on their treatments in a timely fashion. Unscheduled List: Patients who have cancelled or failed to show up to their appointments. Instead of letting these patients slip through the cracks, you can focus on reaching out to these patients to remind them that they're overdue for an appointment. ASAP List: Patients who have an appointment scheduled but want to get in sooner than their scheduled slot. This is a great list of people to contact in the event that you receive a cancellation or no-show. Appointment Lists enable you to contact subcategories of patients based on their appointment status. For example, both the recall list and the confirmation list can be used to print postcards and send email reminders to scheduled and due-to-be-scheduled patients. You can also send electronic appointment reminders and confirmations, and enable new and existing patients to schedule appointments online. Some of these eServices come with additional fees -- you can see the full details here. The Appointments module’s Patient Statuses help keep your staff organized as patients progress through their appointments. Patient statuses aren't just useful indicators of where each patient is physically located—they also generate useful data for running reports. For example, you can use this data to assess how long your patients typically wait in the waiting room. After the exam is complete, you can easily schedule the patient's next recall. The software will automatically calculate the time needed for the procedure(s) based on the treatment plan inputted in the system. As mentioned earlier, one of Open Dental's core tenets is making your data highly accessible. All you have to do is consult the documentation to find out everything you need to know about the database schema. This makes it easy to generate your own reports to analyze answer any questions that you can think of using your data. Open Dental offers more than 2000 query examples to get you started on building every report imaginable. If you don't see the exact query you need, you can either construct one yourself (with a basic understanding of SQL), or hire one of Open Dental's experts to help (for an additional charge.) With the right queries, you can easily extract valuable insights from your data and even integrate with other business intelligence products to better understand how your business is doing. Some reports are text-based, while others, like accounts receivable and broken appointments, are also available as charts and graphs. With its open database schema, Open Dental has the most powerful reporting capabilities on the market, especially for those familiar with SQL. Open Dental is dedicated to giving users more control over their dental practice management software. If you are a data geek who wants to understand everything about your practice, you'll appreciate that Open Dental offers database documentation that enables you to craft extremely specific queries and create an unlimited number of custom reports. In addition to being able to export whatever data you wish, Open Dental also includes many time-saving features, including the ability to set up automated actions (for example, you can set up the software to automatically print out a form upon setting a specific procedure "completed"). It’s worth noting that many cloud-based competitors offer two features that are missing from Open Dental: they allow you to access your dental software from a web browser (so you’re not limited to Windows systems), and they automatically store and encrypt your data in the cloud. If you want to take advantage of those features, then Open Dental is probably not the best option for you (at least until a web-based solution is released). However, if you don’t mind storing and encrypting your own data, you'll find that Open Dental offers every feature you could want in a dental practice management software, at a fraction of the price compared to its competitors. To learn more about Open Dental, you can visit their site here. You can also read our interview with Kevin Rossen, office manager of Rossen Dental and founder of Divergent Dental, to learn why Rossen Dental decided to switch from PracticeWorks to Open Dental, and why he believes it's a better practice management system than some of the larger names in the industry, at a fraction of the price. You can also read our interviews with Dr. Grace Chung and Dr. Saba Rizvi to learn about how they use Open Dental in their office, and how it integrates with different third-party systems that they use.